Sorry if I missed anyone. Good showing already! Bob Dylan should know better than aiming for Eurovision venues at the western fringes of Europe. 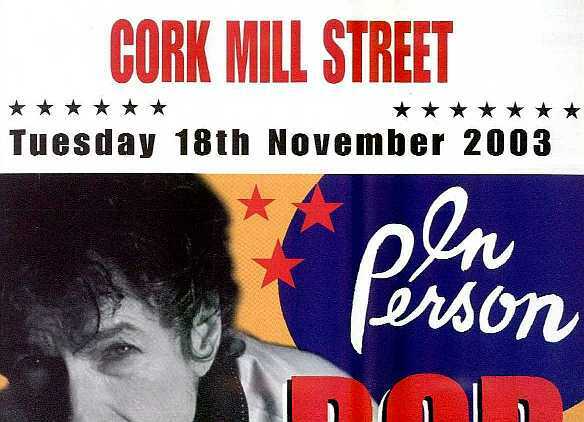 When Dylan intended to perform in 2003 in a very small town here in County Cork, in a large indoor equestrian centre where the 38th Eurovision Song Contest was held in 1993, things did not turn out as planned. I'm going to Rome x3, Firenze and Mantova. Hoping for Milan if a good ticket turns up. I'm going to Roma. All three concerts. i'm going on April 19th. I´ll also go to the show in Wien/Vienna. I was still hoping against hope that I would be able to go to one show. However, my wife was due to have an operation next Monday - this has now been put back to end Feb and as I'll need to be at home as she recovers I'm afraid there's not a chance now. Good old NHS! I'm wondering if there have been any leaks??? I am also going to to the 27.03 show in Madrid. Most likley the 26 aswell. Attending: Helge, Viktor123, Dylaned, The Bard, Sweet Melinda, BrandNewCoatOfPaint. Attending: Helge, Viktor123, Dylaned, Sweet Melinda, BrandNewCoatOfPaint. Flight from Oslo to Rome at the end of Easter - So: Roma 03.04 & 04.04. Thanks to our companion Daniel, add me in Barcelona's 2018-03-30. Just snagged a 3rd row ticket for Verona! Me too, only its row 10. I got 3rd row but waaaay off to the side. Don’t think I’ll write a live set list on ER but I’ll share my thoughts with you after every concert! Last edited by samu_93 on Fri January 19th, 2018, 20:11 GMT, edited 1 time in total. I don't think I will do either. Last years (2006, 2010, 2011, 2015) I had attended 1 or 2 Bob’s concert when he toured Italy. This year I’m going to graduate from the Master in Literature and the gift I wanted was to attend a lot of gigs. Hope we’ll see some song changes in the setlist!